Light weight cotton thermal is 100% Cotton that makes it great for lounging and layering. Chilly has just become Comfortable. This Thermal 100% Cotton Top is great to wear under your tops or alone for lounging in comfort for just a bit more warmth without bulk. The slender cut on this Shirt allows it to gently follows your shape giving breathable warmth and comfort. Standard Sizes S, M, L, XL, 2XL. See approximate BUST measurements in the Size Selections, and for actual Garment measurements, see Size Chart below. Due to the stretch in the thermal fabric, the second measurement is the stretched size. 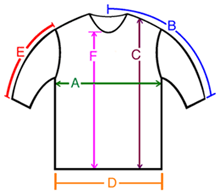 A: Chest / Bust circumference 28-34" 30-36" 32-38" 34-43"
B: Sleeve length from center of neck to end of sleeve 29" 30" 31" 32"
C: Body length from shoulder to bottom of hem 22" 22" 22" 22"
D: Hem circumference 28-36" 30-37" 33-40" 34-44"
E: Sleeve length from shoulder to end of sleeve 23" 23.5" 24" 24"
F: From the bottom of the front Neck to hem 18" 18" 19" 18"